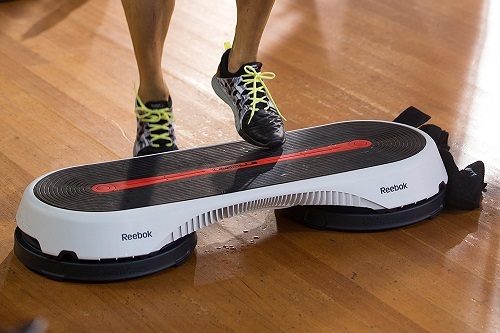 Sport fanatics can now rejoice because Reebok and Les Mills have partnered to create an innovative aerobics step platform for people who want to lose weight or stay fit. Their product, the Reebok Les Mills aerobics step, makes it possible to perform routines such as lunges, split steps, and triple knees. You can even use this tool as a push-up platform. Featuring a red, black and white color scheme, the Reebok Les Mills exercise platform is a stylish piece of fitness equipment. To prevent injuries due to falls, Reebok and Less Mills designed their aerobics step with a non-slip surface. The rubber platform provides a nice grip under your feet. Measuring 42 x 17 inches, it’s also quite spacious so you don’t have to worry about losing your balance while struggling to stand on a small space. Like most aerobics steps, this model offers the ability to adjust the platform’s height. It ships with two risers that elevate the platform to 6-inches. You can also use it without the risers, which will bring down the platform to a floor clearance of 4-inches. When performing fast-paced interval training on an aerobics step, a poorly designed platform will move around and increase risk of falls. However, there is no cause for concern as far as stability and sturdiness go if you choose the Reebok and Les Mills aerobics platform. This aerobics step features skid-free rubber feet that also act as shock absorbers. Risers attached underneath the step use a secure lock in system as well. The platform itself is study, but it can only support a maximum of 242.5pounds (110kgs). If you feel that 2 risers aren’t enough, there is the option of upgrading your aerobics platform. All you have to do is get the Les Mills Smartstep upgrade kit. Indeed, there are cheaper options than the Reebok Mils Aerobics step. With this cardio platform though, you get what you pay for – durability, flexibility, and functionality. This exercise platform is for fitness buffs who want to invest in quality rather than a cheap tool that will wear out quickly.